Yesterday marked the 241st anniversary of the Battle of Brandywine, a pivotal confrontation in the American Revolution between General George Washington and his Continental Army and General Sir William Howe, commander of the British troops. I've written posts about the battle several times before (here and here. Aside from Brandywine's significance as the largest land battle of the Revolution, it also marked the debut in the war of a young volunteer from France. 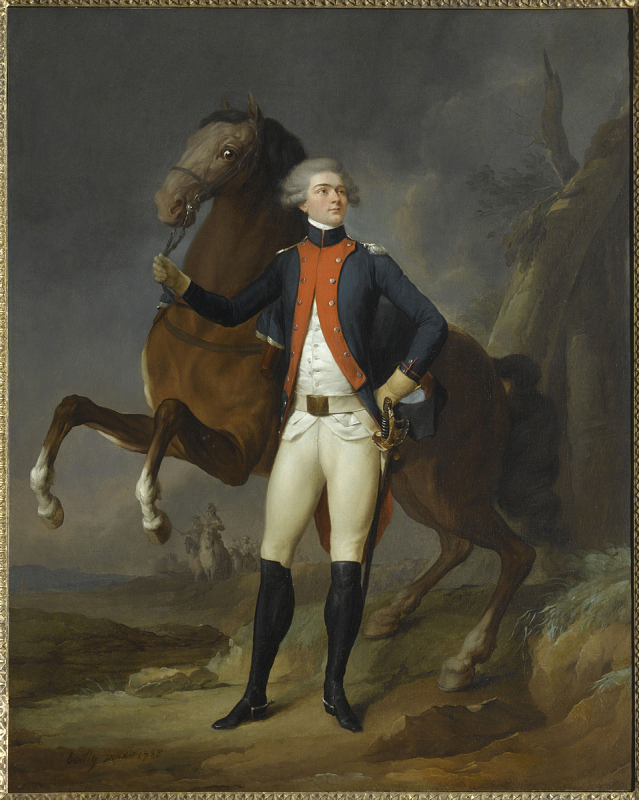 Lafayette is included in a wonderful small exhibition currently on display (through July 9, 2019) at the Smithsonian's National Museum of American History in Washington, DC. Through a well-chosen selection of paintings, maps, and artifacts, The American Revolution: A World War explains how the Revolution was only part of a global shift in the balance of power, war, and conquest that marked the 18thc world. As a Frenchman fighting the British with the American forces and Spanish allies, Lafayette is prominently featured. "In 1824, the Marquis de Lafayette returned to the United States at the invitation of President James Monroe. Over fourteen months, he visited all twenty-four states....[President Monroe's invitation came as America] approached the 50th anniversary of its independence. He hoped the general's iconic presence would help rekindle the nation's "revolutionary spirit" and commitment to unity, which seemed to be slipping away. The trip was a smashing success, but it did not moderate the divisive 1824 presidential contest between John Quincy Adams and Andrew Jackson." 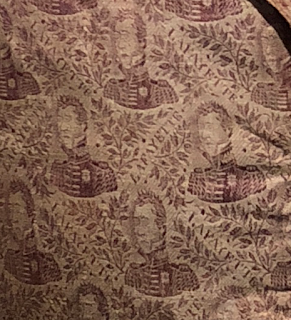 "Hosting the Marquis de Lafayette at a New York banquet, Revolutionary War veteran Matthew Clarkson wore this vest covered with the general's image. During his sojourn, Lafayette attended hundreds of banquets, balls, and celebrations." Above left and detail right: Vest worn at banquet for Marquis de Lafayette, 1824-1836, National Museum of American History. Photos ©2018 Susan Holloway Scott. Lower right: Le marquis de La Fayette en capitaine du régiment de Noailles by Louis Léopold Boilly, 1788, Musée national du château de Versailles. Image ©RMN-Grand Palais/Art Resource NY. How did they make that fabric for the vest? that is remarkable fabric. I don't know that students today even learn about Lafayette or the other foreigners who helped us. From my experiences in high school about half a decade ago, Lafayette does get mentioned but he tends to be the only one and that's only because of his closeness to Washington. Others like Casimir Pulaski are completely ignored. I started singing Guns and Ships, haha. Too true. That's very interesting that people did that! So interesting. I want one. Anyone with a kid in high school or younger knows that thanks to 'Hamilton', they totally know who Lafayette is. 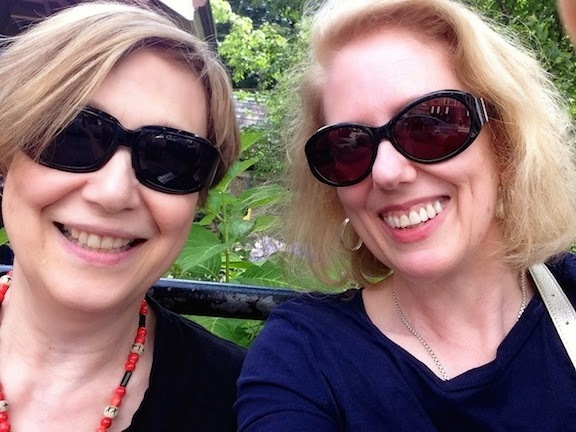 The smart teachers are using the musical in their curriculums, too. I can't think of another show or movie that's made such an impact on kids. 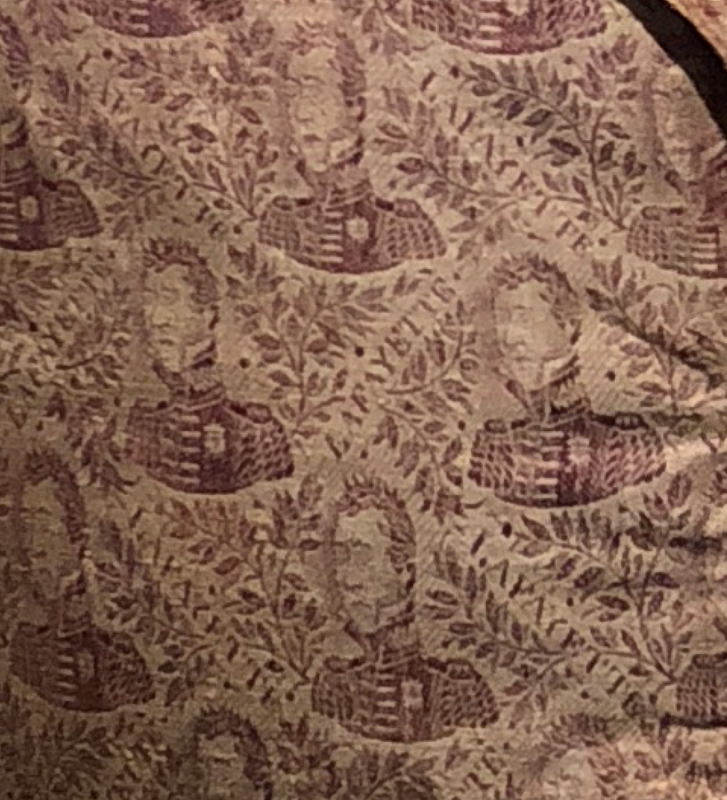 I can't help noticing that the printed fabric is not an overly flattering portrait. Let's hope Lafayette took it in the spirit in which it was meant!